Let’s cook with beer! This recipe has become a staple in our friendship family house old. 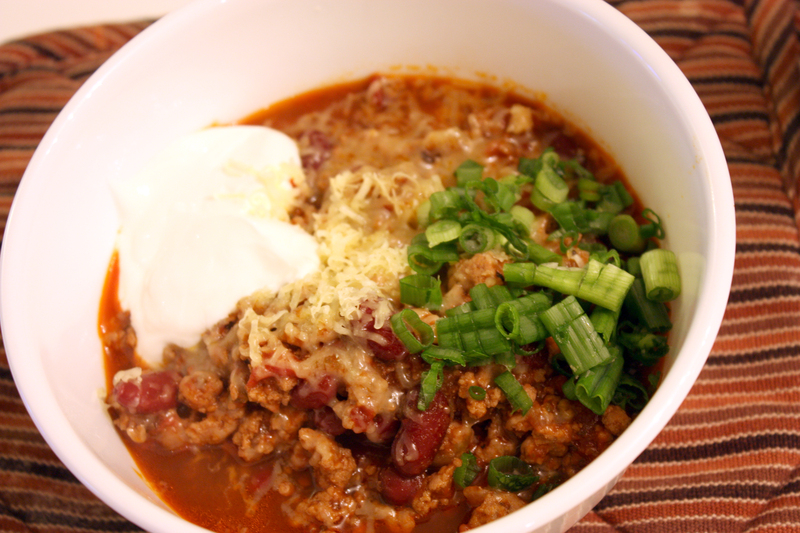 We really like to eat some warm chili when it’s cold out–happens a lot in San Francisco! 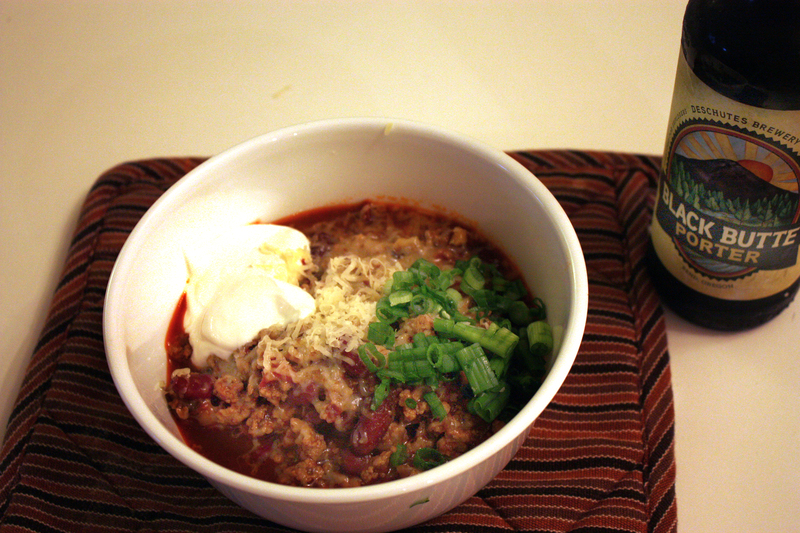 This is a true chili, unlike my usual cross between Chili and Tortilla soup. Sam first brought up this recipe he saw a long time ago. He wanted a go at cooking for the house. The evolution of this recipe is certainly the more interesting aspect. The recipe calls for Modelo for base flavor, but we upgraded to Negra Modelo. To even build on that, we tried Deschutes Black Butte Porter the third time around. It was fantastic. Seems like the darker the beer, the better. Also note, I did this with vegan sausages from Top Dog for my vegan friends. Equally awesome. 12 oz can of red kidney bean, rinsed and drained. There’s one very important thing I learned from learning and making this chili. If you want your minced meat to be fine, go low and slow. First, sweat your onions down in a pot with olive oil heated on medium heat. Season as you go! After about 3 minutes or so, add the garlic. Cook that for 30 seconds just to get the flavors going. Keep stirring! Now add the turkey. You’re not going to hear a searing sound, but that’s okay. Use some muscle to really stir in that meat. Keep mixing until everything is mixed, and the meat is fine and cooked through. Add in the oregano, chipotle, and chili powder and cook for another minute or so. Get those flavors going. Deglaze with the beer, cover, bring to a boil, reduce the heat, and uncover. Let the beer reduce by 1/2. You can use a wooden spoon to measure. Makes things easier. This next part might get messy. Crush the whole tomatoes from the can into the pot. We don’t want the juices, just the tomatoes. It might platter, but the trick is to stab the tomato with a finger (I use my thumb) and just sneeze it like you’re trying to make a diamond from carbon. Give the pot a mix and cook for a couple of minutes before adding the beans. Then let the whole thing simmer until the beans are nice and tender. I’m just getting hungry thinking about this chili. I high suggest making a lot at a time (double the recipe, DO IT!) and freezing it. Take it to work. Eat it for a snap. Or do what I do, make a freaking chili cheese dog!!!!!!!!!! This entry was posted on February 15, 2013 by rrfoods in Dinner, Lunch and tagged beer, chili, chipotle, Dinner, ground, kidney beans, lunch, porter, tomato, turkey.